The Spatial Cognitive Trainer (SCT) is a 3D real-time simulation software intended to support training, assessment and specialization of complex mental processes, by the use of both haptic and 3D visual simulations. The SCT consists of a serious game varying from abstract exercises including 3D shapes puzzle reconstructions (level 1) to more concrete exercises where instead of abstract 3D geometrical shapes, trainees will have to reassemble pieces of a simplified fractured wrist (levels 2 & 3). Each level has 5 exercises. This project research aims at validating the effectiveness of spatial ability training of the SCT. Numerous studies evidence that spatial abilities are related to successful performance in anatomy with traditional static displays (Rochford, 1985, Lufler et al., 2012), as well as with dynamic visualizations of 2D or 3D models (Berney, 2014, Garg et al., 1999, 2001). Spatial cognition is central to understand medical image. In interpreting medical images, specialists have to infer 3D structure of the anatomy of a specific patient on the basis of 3D view given in the image (X-ray. CT scan), and their knowledge of anatomy (Hegarty, Keehner, Cohen, Montello & Lippa, 2007). The SCT is composed of 3 levels in a mimetic immersive 3D workplace. Each level has 5 exercises. 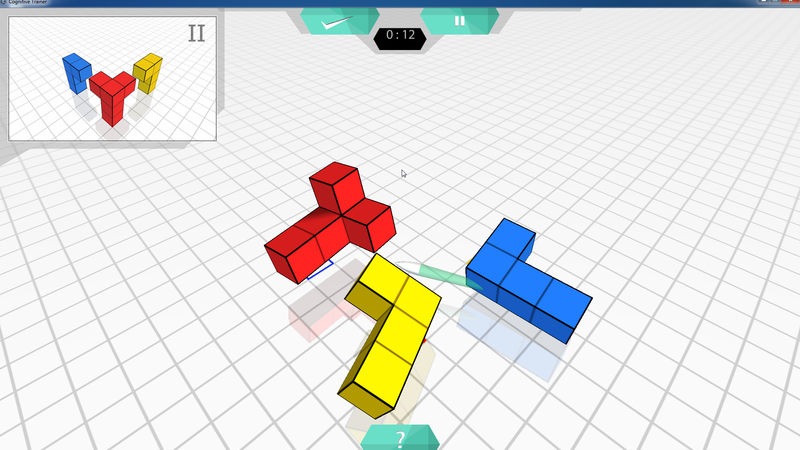 Level 1 is a generic training tool for essential spatial cognition such as mental rotation, movements in space, and spatial transformations in a 3D environment. Levels 2 & 3 are specific and on-topic professional tools for orthopedic surgeons, and more specifically for hand surgeons.